Editor’s Note: The views expressed are those of the author and do not necessarily reflect the official policy or position of the United States Military Academy, the United States Army, the Department of Defense or the United States Government. This article first appeared in The Havok Journal on 20 November 2015. The emerging rift in civil-military relations is the product of over a decade of reflexive patriotism and it is the military’s responsibility to close it. The hard truth is this rift is almost entirely the military’s fault. By accepting the overwhelming trust and legitimacy bestowed on it by a grateful nation without adequate self-criticism, the military has abdicated its voice in the national dialogue to those who do not represent the highly professional and, sadly, quiet majority of those who serve. In large part it is this silence, associated with the professional ethos of humility prevalent in large portions of the service, which widens the rift with the average civilian whom the military serves and is what has allowed the rift to exist in the first place. The latest issue to expose this rift also presents an opportunity to close it. The military’s latest challenge and opportunity is the integration of women into roles previously closed to them. This article takes that issue head on. Carol Costello’s opinion article on CNN titled, “Can alpha males ‘lean in?’” does no service to the challenges the military faces with regards to the issue of gender integration. In the article, Costello is reacting to what she deems a “hostile” response by the cadets at the Air Force Academy to a speaker at a forum on gender issues. 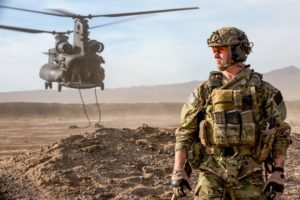 She makes the mistake of equating the attitudes of all service members by drawing a dangerously large conclusion from this limited example about the military’s capacity to accept women in formerly closed combat roles. First, cadets are new to the profession of arms, not yet true members of their service. Their immature reaction certainly does not represent the larger professional force, nor would the same audience at any of the service academies. This does not let our accession institutions off the hook, but one cannot impute conclusions about the attitude within the military at large from a place where we are molding professionals. The national conversation is dominated by those who do not necessarily represent the views of the majority of professionals in the service. It is these voices that drown out the “silent professional’s” voice. Who is this silent professional? It is the man and woman who embraced homosexual service members after the repeal of Don’t Ask Don’t Tell (DADT) without batting an eye. Despite the doomsday analysis of commentators, the transition after the repeal of DADT happened without much angst. In fact, one can go as far as to say that the repeal of DADT was largely welcomed with open arms by the professional force. Studies like the one out of UCLA, “One Year Out: An Assessment of DADT Repeal’s Impact on Military Readiness,” and the RAND study on “Sexual Orientation and U.S. Military Policy,” support this conclusion. The onus is on the military to connect with the American public and discuss shared values. Likewise, the military must engage in the public discussion of integrating women into roles previously closed to them. This is not to minimize the fact that there will be challenges to face, but the professional military force should talk about their efforts to succeed in a manner that moves the dialogue forward positively instead of impeding it. In the end, I have no doubt that our professional force will implement necessary changes to women’s roles in the military with dignity. There will be bumps along the way, but the professional force will be successful. After all, these are the same service members, men and women, who have been fighting alongside one another for over a decade. The “silent professionals” must enter the public dialogue, like that young Air Force Academy cadet who corrected his classmates by ‘leaning in,’ so that their voices and successes are not drowned out, and so that these successes become what earns and maintains the overwhelming trust that has been given to the military.